Much of the attention on reducing greenhouse gas (GHG) emissions, to lower global warming, has been on minimizing and even eliminating our reliance on fossil fuels, and on increasing energy efficiency. Less attention has been paid to changes in how and to what extent land management changes, as well as good old fashioned restoration and conservation measures can contribute to climate change mitigation. A recent study, Natural climate solutions (NCS), by a group of international experts has addressed this shortcoming by analyzing twenty conservation, restoration, and land management actions to determine to what extent they can increase carbon storage and avoid GHGs. The 20 “pathways” covered Forests (Reforestation, Avoided Forest Conversion, Natural Forest Management, Improved Plantations, Avoided Woodfuel, Fire Management); Agriculture and Grasslands (Biochar, Trees in Croplands, Nutrient Management, Grazing – feed, Conservation agriculture, Improved Rice, Grazing-animal management, Grazing-optimal intervention, Grazing – legumes, Avoided Grassland Conversion), and Wetlands (Coastal Restoration, Peat Restoration, Avoided Peat Impacts, Avoided Coastal Impacts). To assess the impacts of these 20 pathways, the study factored in “constraints,” or safeguards, for food, fiber, and biodiversity in implementing the measures. That is, the NCS discussed can be implemented without adversely affecting food, fiber or biodiversity. For example, the study assumed no reduction in existing cropland area but allowed for reforesting grazing lands in forested ecoregions, in light of agricultural intensification scenarios and reduced meat consumption. The study also estimated the potential cost-effectiveness of these pathways, assuming certain costs of climate mitigation at 100 USD/MgCO2e-1 and 10 USD/MgCO2e-1. 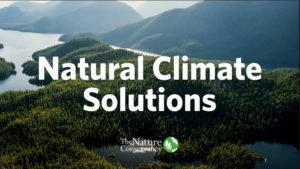 The study found that these natural climate solutions can provide 37% of cost-effective CO2 mitigation through 2030 in support of a >66% chance of holding warming to below 2°C. This scenario assumes the NCS are implemented at the cost-effective level, that fossil fuel emissions do not increase for 10 years, and then decrease by 7% of current levels by 2050 and to zero emissions by 2095. The authors find that over time the NCS will provide a lower proportion of the emission reductions as fossil fuels are avoided and as NCS pathways saturate. So it is important to note that the natural climate solutions are particularly important in the short-term, which in itself is critical for a transition to a low carbon economy by mid-century. In addition, the pathways would produce co-benefits in areas of water filtration, flood buffering, soil health, biodiversity habitat and climate resilience. The study also analyses which of the various pathways produce more of the impact from NCS on GHG emission reductions. 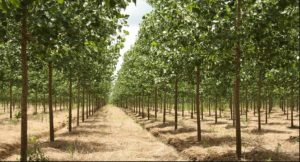 They find that Reforestation offers over 2/3 of the cost-effective NCS mitigation necessary to hold global warming to below 2°C. It also provides significant co-benefits through biodiversity habitat, air and water filtration, flood control and soil fertility. Avoided Forest Conversion has the second most cost-effective and maximum mitigation potential. One issue affecting this pathway is the problem with uncertain land tenure in frontier landscapes. Agriculture and grassland pathways provide 1/5 of the total NCS mitigation necessary for a below 2°C warming. Finally, Wetlands offer 14% of NCS mitigation, and avoiding the loss of wetlands is less expensive than restoration, with better mapping of peatlands a priority. One of the important considerations revealed by the study is the role that NCS can play in a transition to a low carbon economy, especially in the short-term, by mid-century. If the focus and finances are centered on natural climate solutions, then there is less justification for the support of natural gas, through fracking or any other extraction process, as a transition energy source. Previous articleExtreme Weather Attribution: It’s Here to Stay Next articleA Tipping Point on Climate Change in Ireland?